Get the Jump on Your Nursery Decorating Project with These Gorgeous Frog Baby Nursery Theme Ideas and Crib Bedding Sets. Surround your little one in the peace and quiet of frogs croaking and crickets chirping on the pond. A Sammy or Sally frog nursery theme is perfect for a baby boy or girl. The gorgeous water friends will capture your little one's imagination right through toddlerhood and beyond. From the laid back Jeremy Fisher to the dazzling Frog Prince, there are plenty of imaginative and colorful ways for you to bring the tranquility of pond life into your baby's nursery! You'll also find a country basket full of ideas in the wide range of frog baby room decor available on the market. 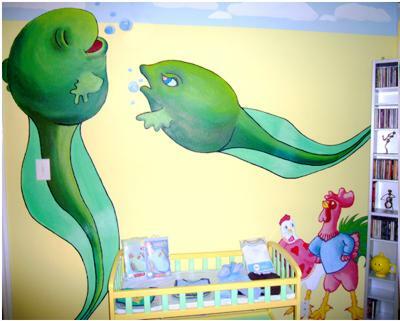 From rainforest tree frogs to dancing ballerina frogs, you'll find everything you need to decorate your frog in the pond baby nursery room at our Frog Nursery Theme Decor Store. 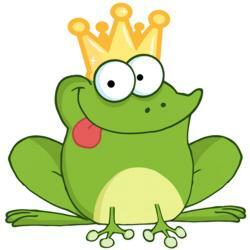 Or visit the Froggy theme section at ababy.com. You'll find plenty of mix and match pond theme decor all in one place. Furniture, bedding, lighting, rugs and more. Everything you need to create a frog's paradise! 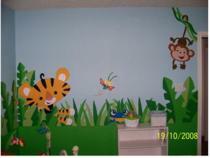 Get darling baby nursery theme ideas and decor at ababy.com's Frog and Bug theme section. 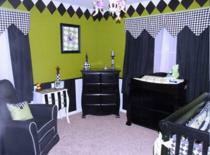 If you are decorating a frog theme nursery enter it in our baby nursery photos contest here. You could win a great prize and we will add your nursery to this page to inspire other moms! Create a tranquil, peaceful nursery by using pastel colors. Include blue, green and yellow as a starting point. If you are decorating a nursery for a girl you can add pinks and lilacs to your color scheme. Try adding pink water lilies and lilac butterflies. To create a more masculine nursery add in some browns and reds. You can achieve a more modern look by using bright greens and blues on a white background. Lily pads and water lilies. Snails and lizards basking on a rock. You can incorporate a real fishing pole by using it as your curtain rod. Create an authentic watery world by incorporating sea grass in your baby nursery. A sea grass rug is a good place to start. Set the other animals around your pond in the water, amongst the rocks or flitting through the reeds. Create a vintage frog baby nursery by using soft colors and fabrics and incorporate old Beatrix Potter books and Jeremy Fisher and Jemima Puddle Duck figurines. If you want to go for a cartoon type frog theme, you can base your theme on Kermit the Frog and the Muppets. 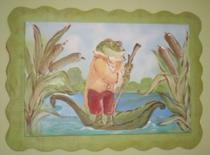 For an authentic frog's paradise you'll need to fill your walls with a froggy pond mural. If you don't feel up to painting the whole thing just paint the background and then add your cast of pond characters using wall stickers. Base your theme around the Frog Prince for something magical. Add crowns and jewels and magic wands and remember - it's easy to turn your prince into a princess for a baby girl's nursery. Another gorgeous idea for a baby girl's room is to include ballerina frogs - so cute. Add ballet slippers and tutus. This idea would also combine well with a vintage look. For a brighter option why not go for the bold colors of the rainforest and add colorful tree frogs all over the room. A great frog baby nursery theme idea for a more contemporary nursery is to combine your frog motif with crisp stripes or playful polka dots. Don't forget to add lots of cute and cuddly soft frog toys. And last but not least, make sure you include some storybooks with a frog theme on the bookshelf. Share frog stories and interesting frog facts together before bedtime.